Missionaries for The Church of Jesus Christ of Latter-day Saints devote between 18-24 months of their lives in service to people across the world. Their memoirs and moments now have a companion worthy of their service. A truly inspiring brand! When Preserve a Mission came our way, we knew it was a company we had to represent. 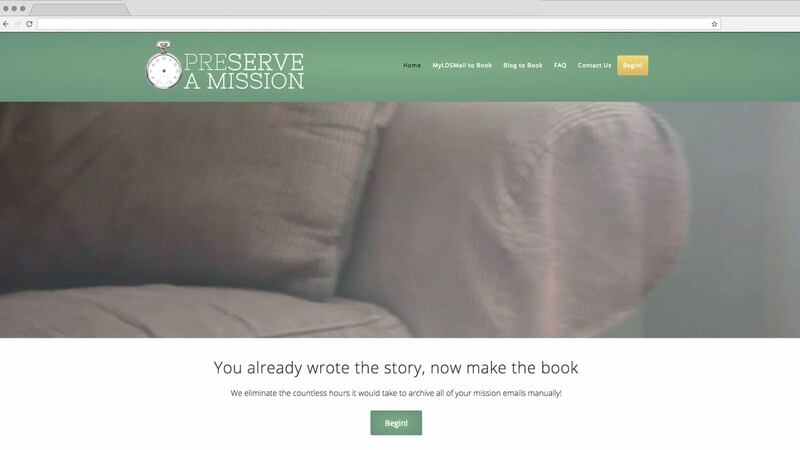 By quickly creating memoirs for the young men and women working to serve a higher purpose, Preserve a Mission's modern take on traditional book printing serves LDS missionaries in a way nobody else can. Not only is this project one of our most exciting, it may be our most challenging and ambitious to date. We have a dynamic team of software and web developers who have pushed their skills to the limit and have found new limits to explore. What would take hours to do on rival sites like Shutterfly now takes only minutes, at a price point within any budget. More than that, the results of selfless giving are forever captured in a hardbound heirloom, complete with heartfelt messages and brilliant images. Even the most worthwhile causes need planning, strategy, and execution to come to life. Preserve a Mission presented challenges we've never faced before, and we loved working together to come up with intelligent and effective solutions.